FILE - Vietnam's President Tran Dai Quang, second left, and his wife Nguyen Thi Hien, left, pose with Chinese President Xi Jinping and his wife Peng Liyuan during a welcome ceremony for leaders attending the Belt and Road Forum, at the Great Hall of the People in Beijing, May 14, 2017. China is finding Vietnam to be a tough partner as Chinese firms try to do more business with the long-time political rival along its southern border. Vietnam’s legislature, faced with public protests, has put off until May 2019 a bill that would let Chinese and other foreign investors use special economic zones. The government in Hanoi also warns against taking out preferential loans from China for infrastructure development. It has cautioned as well against Chinese development aid. 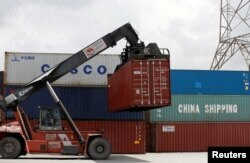 Still, the Vietnamese are allowing a surge of private business with China as it benefits their country, experts say. In one sign of that trend, Chinese companies are setting up factories in Vietnam to dodge the Sino-U.S. trade dispute, said Maxfield Brown, senior associate with the business consultancy Dezan Shira & Associates in Ho Chi Minh City. In a separate development, companies along the border from October can settle deals in Chinese yuan per popular demand as trade increases, the Viet Nam News reported in August. “My general take is that economic relations between the two countries will get stronger in the next five years partly because of America’s more America-first attitude to Asia Pacific, but also there’s just a lot of economic benefits,” said Adam McCarty, chief economist with Mekong Economics in Hanoi. Containers of China Shipping and Cosco are loaded at a port in Ho Chi Minh City, Vietnam, July 27, 2018. Deals that quickly help Vietnamese without the risk of giving China any control of their economy will work, while others will face a backlash, analysts expect. This dynamic may frustrate China, which is used to easing political disputes with other countries by offering benefits from its $12 trillion-plus economy, the world’s second largest, analysts say. Countries unhappy with China sometimes turn to its chief geopolitical rival the United States for help. “The reason why the increased inflow of Chinese invest[ment] in Vietnam is noteworthy is that it is occurring in spite of the Vietnamese public’s unfavorable attitude toward Chinese economic influence and penetration,” said Fabrizio Bozzato, a Taiwan Strategy Research Association fellow specialized in East Asia. “China’s policy of economic engagement in Vietnam reflects (Chinese) President Xi Jinping’s vision of a new improved relationship with Vietnam,” he said. 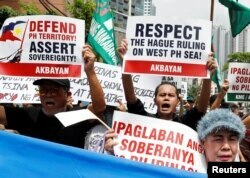 Members of the Akbayan activist group chant anti-China slogans as they march toward the Chinese consulate during a rally on the South China Sea dispute, in Makati, Metro Manila, in Philippines, July 12, 2018. Two years ago China lost a World Court arbitration case. Since Beijing lost a World Court arbitration in 2016 over the legal basis for its South China Sea claims, it has stepped up economic relations with the most vociferous counterclaimant, Vietnam. Many Vietnamese also resent China because of previous border disputes, which led to clashes in the 1970s. In 2014, Vietnamese rioted against Chinese companies after a boat-ramming incident in the sea. This June, protests against the special economic zone bill prompted legislators to delay it. Vietnamese want “economic action” but without becoming “a satellite of China,” McCarty said. 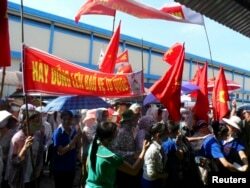 FILE - Workers wave Vietnamese national flags during an anti-China protest at a Chinese shoe factory in Vietnam's northern Thai Binh province, May 14, 2014. Thousands of Vietnamese set fire to foreign factories and rampaged in industrial zones in the south of the country in an angry reaction to Chinese oil drilling in a part of the South China Sea claimed by Vietnam, officials said. Since 2003 Vietnam has built ties with major powers on a policy of “cooperation and struggle,” said Carl Thayer, Southeast Asia-specialized emeritus professor at the University of New South Wales in Australia. “This meant cooperation when it suited Vietnam’s economic interests and struggle, opposing a country when it infringed on Vietnam’s national interests,” he said. Today’s Vietnam is cautious about applying for loans from China’s Belt and Road Initiative (BRI), said Le Hong Hiep, a fellow at the ISEAS-Yusof Ishak Institute in Singapore, in a March research paper. The Belt and Road is a $1 trillion campaign to build infrastructure and trade routes around Eurasia. Countries such as Kazakhstan, Malaysia and Sri Lanka have allowed China to get involved in more local development work. Vietnam may test China’s initiative by applying for “a couple of pilot projects,” Le said. China cares about how Vietnam reacts, he added. “As the BRI is about China’s stature as a benevolent rising power, Vietnam’s diplomatic support for it will still matter to China,” he said. Private business from China is growing, and the Vietnamese government accepts company partnerships so local firms can become competitive, Brown said. Chinese companies are often bigger and better connected offshore. Chinese investment in Vietnam reached 7.7 percent of the total from other countries in 2016 at $1.88 billion after a steady rise since 2021. Japan, South Korea, Singapore and Taiwan are among Vietnam’s top sources. Trade with China came to $93.8 billion last year and grew another 28.8 percent in the first half of 2018. Chinese firms are setting up factories in Vietnam, particularly now, to avoid paying higher tariffs for exports to the United States as required for goods shipped from China, analysts in Vietnam say. These investments play into Vietnam’s hands as it seeks factory investment to sustain economic growth of 6.8 percent last year.